"Our benchmark test showed that OpenCNC is as twice as fast as Siemens or Heidenhain controls," says Rolf Wissner, CEO of Wissner GmbH. 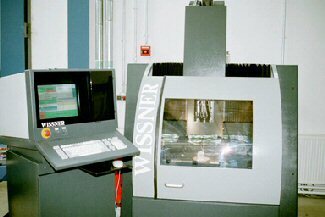 A machine tool builder of highspeed cutting machines, WISSNER GmbH, Göttingen, Germany, chose MDSIs OpenCNC for a new line of Gamma 303 highspeed cutting machines. WISSNER design engineers used OpenCNC Software Developer Kit (SDK) to design their control, which featured OpenCNC's Adaptive LookAhead Logic for high-speed machining.